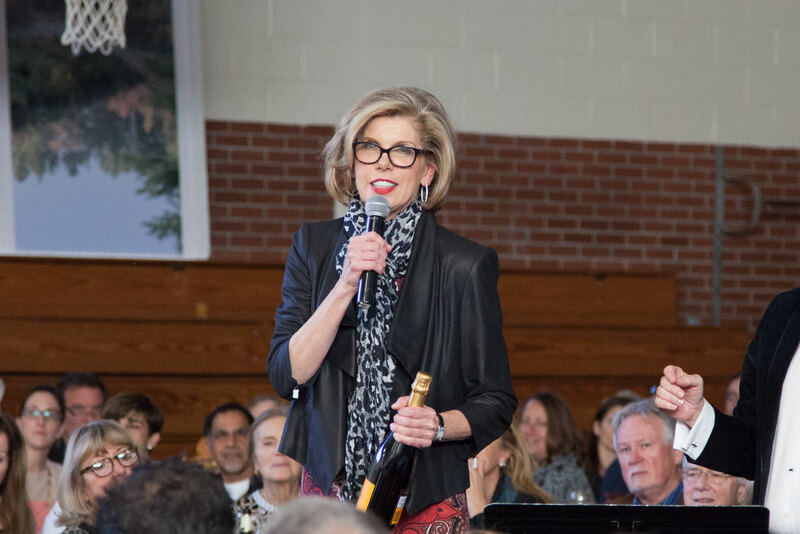 Christine Baranski photographed by Lora at last year’s event. You’re the auction chair for the HVA Annual Auction Gala this year…why do you think it’s so successful each year? The great thing is that it’s the whole Housatonic Valley, it’s not just one town with a land trust. It’s people from the entire area. We share the same air, we share the same water, we share the forest, we share the beauty of this part of the world we live in. Over the years it has gotten to feel more like a community party, and there are so many people who live in that neck of the woods who are deeply aware of how precious it is to live somewhere so beautiful. Is there anything you’re excited to bid on this year? I’m on the Board of HVA, but I don’t usually get to go to board meetings because I’m in New York working, but if I can contribute by showing up as an actress who has some level of visibility….I’ve been doing this since I was on The Good Wife. Diane [Von Furstenberg] suggested that I take over from her as the yearly honorary chair and it’s my pleasure. Why are you so committed to this particular cause? I believe in the organization strongly… I raised my kids in Bethlehem. We did a lot of commuting. My husband and I didn’t want to raise them in New York or Hollywood. So we gave them a beautiful country life. Everyone is as responsible as the next person for not only enjoying it, but for maintaining it and treasuring it. It’s all of our backyard. Go online and check out HVA’s website which will tell you all the incredible work they do of saving rivers and forests, and teaching children to love the natural world. The organization does the most amazing things. Now they’re dealing with the effects of global warming. There’s new work to be done. We have storms, we have floods, we have run off; all directly related to climate change. I think everyone is feeling it now. We’re at the 11th hour. So, I’d say your readers can read up on the organization, come to the auction, or just send in a contribution. I love seeing the same people and it always makes me happy to see new people. Last year we had Seth Meyers come, and Diane came. I’m always happy to see any of the honorary chairs. Excellent, well, we’re very much looking forward to it too! We’ll be sure to say hi! We learned a lot about the work HVA does during our Source to Sound paddling experience last year. Check it out here. Look for our blog post coming soon about this year’s event….who knows what will happen! ?